Perry-Mansfield Performing Arts School and Camp began in 1913. Located in a charming, rustic camp setting in Steamboat Springs’ Strawberry Park, the camp is the longest continuously operating camp of its kind in the United States. Creative and educational programs in dance, theatre, art, music, writing, equestrian, and more, make it a unique haven for diverse artistic expression for students ages eight through college. Camp founders Charlotte Perry and Portia Mansfield had a tenacious and innovative vision. Their vision and camp are thriving today in its 100th year. 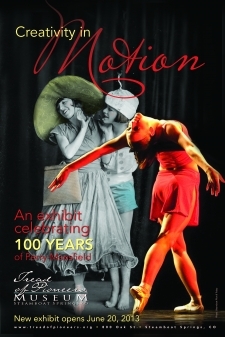 “Creativity in Motion” is an exhibit celebrating Perry-Mansfield’s 100 years in our community. The exhibit highlights the founding of the camp, the brave and visionary two friends who created it, the famous alumni and teachers that have attended, and the camp’s outlook on the next 100 years. View early camp costumes, promotional materials, and original 100th anniversary artwork inspired by camp co-founder Charlotte Perry and local artists. On display June 2013-May 2014 at the Tread of Pioneers Museum.